Today marks the third edition of the Boston Herald to ignore the death of the great Seamus Heaney. It’s not like anyone at the dicey local tabloid would have to actually read some of Heaney’s poetry. 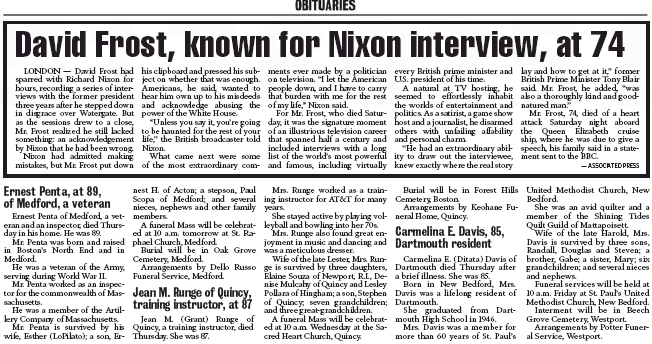 They could just run a wire story, they way they did today with David Frost’s obituary. My first thought on hearing the immeasurably sad news of Seamus Heaney‘s death was a sensation of a great tree having fallen: that sense of empty space, desolation, uprooting. 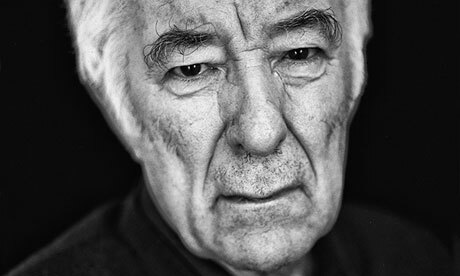 Heaney’s place in Irish culture – not just in Irish poetry – was often compared to that of WB Yeats, particularly after he followed Yeats in winning the Nobel prize in 1995. He possessed what he himself ascribed to Yeats, “the gift of establishing authority within a culture”. But whereas Yeats’s shadow was seen, by some of his younger contemporaries at least, as blotting out the sun and stunting the growth of the surrounding forest, Heaney’s great presence let in the light. Part of this was bound up in his own abundant personality. Generosity, amplitude and sympathy characterised his dealings with people at every level, and he was the stellar best of company. It was as if he had learned the lesson prescribed (though not really followed) by Yeats: that the creative soul, “all hatred driven hence”, might recover “radical innocence” in being “self-delighting, self-appeasing, self-affrighting”. For God’s sake, Heraldniks – just run something. 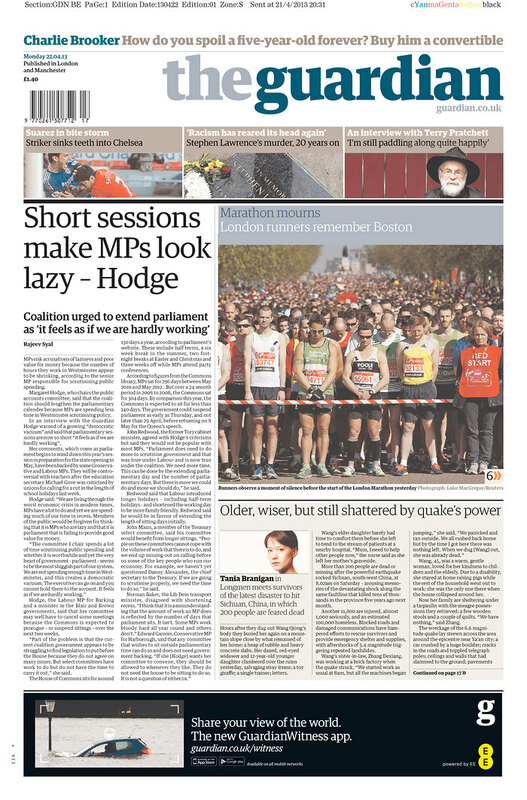 Boston was on the mind of everyone who ran the London Marathon yesterday, as Page One of The Guardian attests (via the Newseum’s Today’s Front Pages). And London was on the mind of the Boston dailies – especially the Globe, which sent sportswriter Shira Springer over there to cover the event. 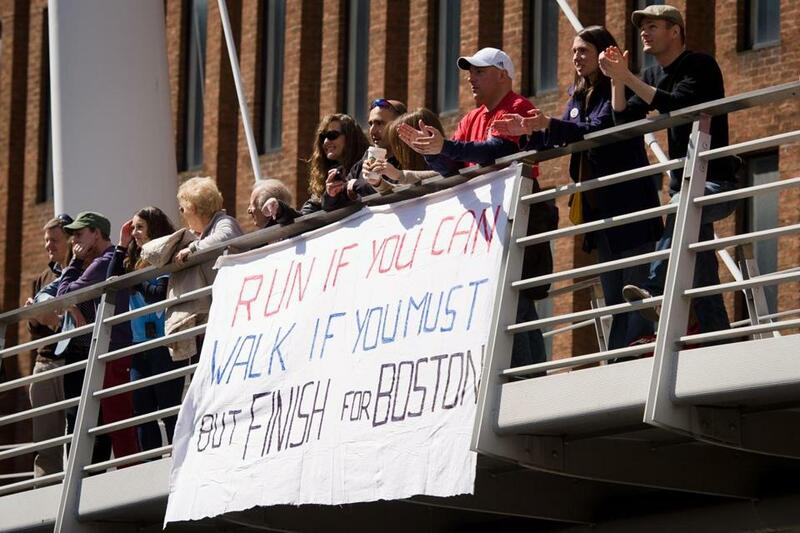 For a day, at least, Boston and London were One as well.